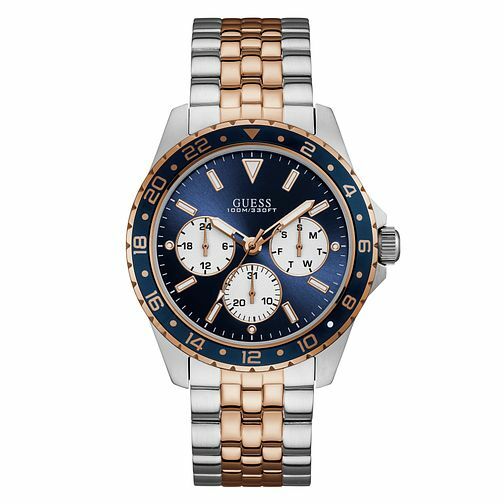 This Guess two-tone timepiece is a cool and contemporary men's accessory, with a rich blue dial complete with rose gold tone accents and three dials displaying the day, date and 24 hour analog hours. A rose gold plated and stainless steel bracelet adds a chic fashionable touch, a sleek everyday piece for the modern guy. Guess Men's Two Tone Bracelet Watch is rated 5.0 out of 5 by 2. Rated 5 out of 5 by Anonymous from Grandad loved it for his birthday My grandad picked this watch for his birthday and he loved it as soon as it came. He had to have one link removed but overall the colour, features and price were excellent. Would definitely recommend.